At first glance, it seems that the only thing Dash and Lily have in common is the fact that both teens are pretty much alone this Christmas. Lily is devastated, but Dash is looking forward to the quiet and for the day to be over with. Then, just days before Christmas, Dash finds a red moleskin notebook at The Strand, his favorite bookstore. And in this notebook are a series of clues and dares, written by Lily. Dash follows them, and then leaves a few dares of him own, until the two are sending each other all over New York City. In the context of the notebook and each other's dares, they seem perfect for each other...but will they be completely different people in real life? 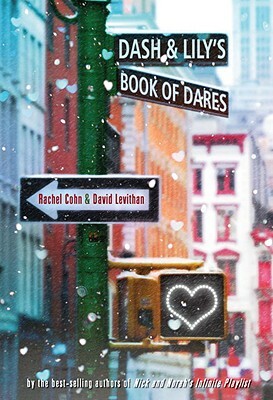 This latest collaboration between David Levithan and Rachel Cohn is the best yet. Dash and Lily's Book of Dares is such an amazing book, full of coincidences, excitement, and hilarity. Dash and Lily have two very distinct personalities, but yet they work together so well. Levithan's style, penchant for using the most fascinating words, and Dash's dry sense of humor will have you laughing unexpectedly. Lily is probably the best character of the book though--she's not brimming with self-confidence and she doesn't have many friends, but she is funny, smart, and energetic, and she proves that you don't have to be a popular or an experienced heroine to be entertaining. The Christmastime in New York City setting is also perfect for the story and feeds right into the atmosphere of Dash and Lily's relationship--excited, frenzied, always busy, and fraught with conflicting emotions. This is generally an upbeat and entertaining book, though it's not without its moments of doubt and fear and sadness as Dash deals with his family issues, Lily with her struggles with fitting in and making friends, and both of them face the prospect of meeting, and perhaps not living up to each other's expectations. This is an excellent pick if you like your romances with a bit of reality, humor, and snark, and it's packed full of funny one-liners you won't want to forget. Cover Comments: I don't think that this cover stands out as much as the duo's previous book covers, but I do think it is charming and clever. The street signs seem appropriate given the fact that Dash and Lily spend the majority of the book sending each other places, and I like the subtle use of the hearts on the cover. Ooooooh I want ot read this book so bad! Awesome review! I loved this book too! I loved this book! I think the characters were so good partially because they were written by different people. Anyway, great review! Oh, such a lovely review! Of their covers, my favorite is the one for nick and norah, with the purple city skyline. I ordered this book right after I read the review(!!! ), but I was wondering if these authors have written anything else together-- the review made it sound as if they had. emmgirl: Yes, they wrote Nick and Norah's Infinite Playlist and Naomi and Ely's No Kiss List. This sounds like such a fantastic book! I've read their other ones, so I definitely need to add this to my TBR pile. I very much enjoyed this book as well. Tended to think that the authors were hinting at a different ending, but don't want to spoil it. I love their work--individually and as a team. I absolutely adored this book! Perfect non-corny Christmas read! The Santa part made me DIE laughing. I went to a signing for this book at my local indie and hearing David read from this part just made it all the more hilarious! This is my all-time favorite book! I love Levithan's use of words. Great review, you captured it perfectly!